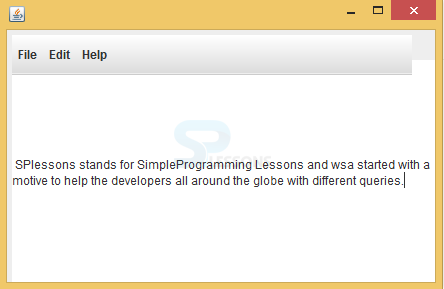 Swing Notepad Application is a program used to edit the text files and to store the files.The excellent feature of Swing Notepad Application is UTF-8(encoding character). Developers will use Swing Notepad Application to write the source code because it provides encoding format where as word document stores the data in binary format. Features of Swing Notepad Application as follows. Create the package name as Swing, all the components will be stored under this package. Import all the required packages to build notepad. 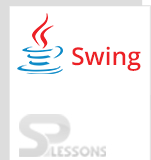 import javax.swing. *;//import all the required packages. Create a frame, menubar with (file,edit,help), menu items with(cut,copy,paste,selectAll), text field. JMenu file,edit,help;  //adding menu items. Create the constructor and this constructor name should be same as class name. Include menu items into the frame, copy, paste, selectAll are the sub menus. Add ActionListeners to the menu items. It will be performed when user click on the menu items. cut.addActionListener(this); //added ActionListeners to the menu items. Create menu elements into the menubar. Menubar may consists of sub menus. Provide edit option to the all menu items. Add menubar and text area to the frame. Action needs to be performed when user click on the buttons.When user click on cut the text will be vanished and it can be placed any where with paste option.Cut and paste both uses paste operation. Output will be as follows.Where user can write the data, edit the data, store the data that can be readable. The great feature of notepad is UTF-8. Notepad only supports to text editors, it does not support images. ActionListener interface should perform on the components to register the objects.